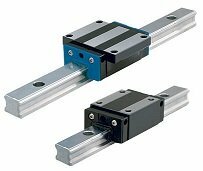 Rails and guide blocks, also often referred to as simply linear guides, are high end linear motion systems. Linear guide block systems are another form of linear bearing system used to move a load along a straight path with as little resistance to the direction of motion as possible. The best CNC routers use these systems on their machines to move the gantry and router carriage. However, with the advantages of todays market for used items, such as Ebay, even the DIY CNC router builder can have these linear motion systems on their machines. These systems offer numerous advantages over other linear motion systems. As with most high end systems, there are some challenges to overcome when using these components on you CNC machine. But before we get into that, lets take a look at how these systems work. Linear guide blocks and rail systems are, as the name suggests, composed of two primary components. The linear rail, which guides the guide blocks and provides a smooth and durable surface for linear motion, and the Guide Block which rides on the rail and supports the load that is to be moved. Pretty straight forward, nothing too difficult there just think of it as a roller coaster, with the rail being the track and the block being the cars. There are several advantages to linear guide systems. For starters, they are very robust and accurate due to their construction. Most all guide block systems use ball bearings to roll the load along the rail, which means high efficiency. This high efficiency means less work must be done by the drive system to move the load. Another advantage to linear guide systems is their high loading capabilities. One of the primary aspects of linear guide blocks and rails that set them apart from other linear bearing systems is that they are fully supported along the length of travel. These systems offer push, pull, and rotational/moment load resistance in many directions. We will discuss more on load and speed ratings of these systems in a later section, but first lets take a detailed look at each of the components that make up a linear guide system. First well take a look at the RAIL.